Friction is what keeps us from realizing our goals. It is what compromises all of our plans, sometimes making them unrecognizable. It defies our wish for perfection and constantly surprises us with new elements of resistance. It constitutes the divide between dream and reality.But friction is also what gets us moving, a necessary incentive to achieve progress. Nothing can start if it cannot push off something else. By blocking or delaying the easy solution, friction makes for a richer, more varied world. If it stops schemes from being completely fulfilled, it also stops them form going totally awry.To the modernist project, with its one-sided rationalist pretensions, friction is unambiguously bad?and so it is being disposed of at an increasing speed. The currency markets are one example, cyberspace another. This means less and less time to pause and rethink, while the vulnerability of societies is aggravated. 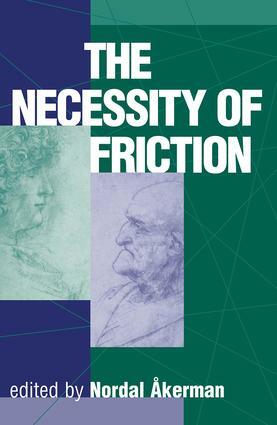 In The Necessity of Friction, scholars tackle this topical and important concept. A number of scientific fields are engaged: physics, philosophy, economics, architecture, organizational theory, artificial intelligence, and others. Together, these contributions form the first modern-day attempt at analyzing the intriguing yet elusive subject of friction as metaphor. Points Of Departure * A Free-Falling Society? : Six Introductory Notes Nordal kerman. On The Battlefield * Friction and Warfare Chris Donnelly. Incentives For Progress * Let Us Now Praise Dragging Feet! Ottar Brox. * Social Change Induced by Technology: Promotion and Resistance T. R. Lakshmanan. * Inertia and Development Models Georg Srensen. Rationality In The Marketplace * Friction in Economics Keith Griffin. * Essential Friction: Error-Control in Organizational Behavior Gene I. Rochlin. Elation And Frustration * Playing, Writing, Wrestling Sigrid Comb chen. * Why Things Dont Happen as Planned Jon Elster. * Six Pomes en Prose Klaus Rifbjerg. Structuring The Human Space * The Desire for Order Joanne Finkelstein. * Stay in My House Kaj Nyman. * Unpredictability, Frictions, and Order ke E. Andersson. * Friction and Inertia in Industrial Design John Heskett. * Friction: An Exemplary Physical Disposition Rom Harr. * Friction of Bodies, Friction of Minds Agnes Heller. Into The Future * Frictionless Forecasting Is a Fiction Hubert L. Dreyfus and Stuart E. Dreyfus. Metaphor Transferred * Rediscovering Friction: All That Is Solid Does Not Melt in Air Helga Nowotny.